Découvrez quelques-uns des points forts de la Toscane lors de cette excursion d'une journée en bus depuis Florence. 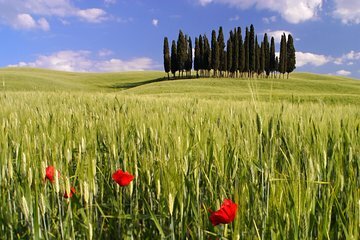 Visitez les villes historiques des collines de Pienza, Montalcino et Montepulciano; admirer le magnifique paysage couvert de vignobles de la vallée d’Orcia (Val d’Orcia); et profitez de dégustations de fromages et de vins en vous arrêtant dans les établissements vinicoles locaux et autres lieux. C’est une excellente journée dans la campagne italienne. Really enjoyed our tour - our guide Valentina was so informative and pleasant . The 3 hill towns and surrounding valley simply gorgeous . Our wine tasting was delicious and included excellent educational info . Even saw filming of The Medici Netflix series! Was a long day but we’ll worth it . Julio the guide was awesome! Cities were more than expected... wish we had more time. Bus seats were not comfortable, but the usb charger for each seat was nice. Spotty WiFi access on bus. Make sure to wear comfy shoes because there are plenty of stairs and inclines. I would do this again thru this tour company. the trip was perfection. the schedule was well paced with enough time to enjoy each site. the guide, Brando, was informative and really cared about showing this beautiful part of italy. highly recommended. Lovely day. Great guide. Well organized. Felt we got to experience each stop. Great Tuscan scenery on the way to each destination. Wine tasting was good. Very nice tour. Our guide Marta was very sweet and knowledgable. It is a long day and unfortunately it was raining for a good part of ours. However you do get to see some very cute towns, I never would have visited otherwise. I wish the cheese tasting was a little more extensive, we just got to try three pieces of Pecorino on tooth picks. But if you enjoy wine and the countryside, it's a good way to experience both. Every time I do a bus tour through Viator I end up spending most of my time on the bus listening to commentary and taking awful pictures through the window. I liked the guide immensely but there is just so much you can do when you have a bus full of people and limited amount of time. Because we had no real time to eat, I ended up getting very sick on the way back to Florence. The only thing I can say positive about this trip is that I saw some new countryside for the first time and met some very nice people. This is a very long but immersive tour. The guides were great and knowledgeable about the regions’s history. If you only have one day to spare this tour will give it a lot to you. There are some short breaks to do a bit of shopping. But don’t dawdle!